Any theory of thinking or teaching or learning rests on an underlying philosophy of knowledge. Mathematics education is situated at the nexus of two fields of inquiry, namely mathematics and education. However, numerous other disciplines interact with these two fields, which compound the complexity of developing theories that define mathematics education. 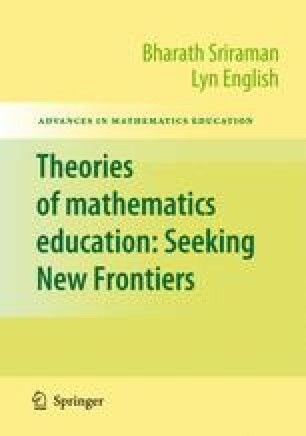 We first address the issue of clarifying a philosophy of mathematics education before attempting to answer whether theories of mathematics education are constructible. Pepin, B. (1998). Mobility of mathematics teachers across England, France and Germany: Any problems? Paper presented at the European Conference for Educational Research, University of Ljubljana, Slovenia September 1998. http://www.leeds.ac.uk/educol/documents/000000871.htm, accessed November 12, 2006.